"I was like, "Yup, yup, you're right, this is the Olympics Games, we have to finish this,'" Hamblin said of the scene that warmed the hearts of fans during a qualifying heat of the women's 5,000 meters in Rio de Janeiro, as Hamblin and D'Agostino set aside their own hopes of making the final to look out for a fellow competitor. Hamblin fell heavily on her right shoulder, D'Agostino got up, but Hamblin was just lying there, and she appeared to be crying. Instead of running in pursuit of the others, D'Agostino crouched down, put her hands under the New Zealander's shoulders to help her up and softly urged her not to quit. "That girl is the Olympic spirit right there," Hamblin said of D'Agostino. "I've never met her before . . . and isn't that just so amazing." 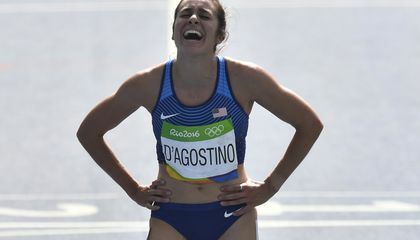 As it turned out, D'Agostino probably needed more help, and she soon realized she'd hurt her ankle badly in the fall, but she refused to give up, and ran nearly half the race with the injury. Hamblin did what she could, hanging back with D'Agostino for a little while to return the favor and offer encouragement. "She helped me first, I tried to help her," said Hamblin, who eventually had to leave D'Agostino behind and was certain that the American would have to stop. "I didn't even realize she was still running (and) when I turned around at the finish line and she's still running, I was like, wow," Hamblin said. She waited for her new friend to cross the line and they hugged, only this time, it was D'Agostino who was in tears. 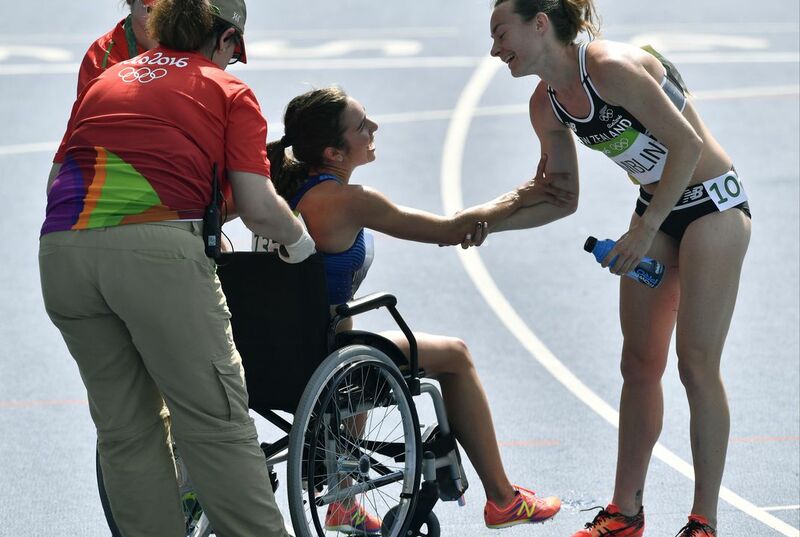 As D'Agostino was about to be taken away in a wheelchair, she stretched out her right hand and the two runners gripped each other's forearms for a few moments, after they had provided a memory that captured the Olympic spirit. In response to "After the fall, a display of Olympic spirit ," I agree that it was a good thing that D'Agostino helped Hamblin even though she could have kept going. One reason I agree is that D'Agostino knew she was not going to win so she had nothing to loose. Another reason is that it showed the world how great it is to help others even when she got nothing in return. It says in the article "That girl is the Olympic spirit, I've never met her before." This shows that even though she is on a different team and didn't know her, she showed kindness to the world. A third reason is that she was representing for USA. Even though thousands of people help others every day, I think her act of kindness was seen by millions and could encourage others to be kind. The girls were sure they had lost because they had both fallen and were injured unlike the other racers. Helping each other after a fall in a huge race is true sportsmanship. Being injured and both of the runners kept going that is not only determination but a message to the younger generation saying that no matter what you're going through to not give up. What happened after the two runners fell is truly inspirational and will be remembered. The girls were sure that they had lost because they had both fallen and they were injured in some sort of way. But he girls also did not let that stop them even when the pain hurt the most both of the girls kept on pushing themselves all the way to the finish line and never gave up! All because the two girls never gave up they won bronze and silver medals!! In response to "After the fall, a display of Olympic sprit" the girls knew they had lost, because they were helping each other out while the other people were running to win. American D'Agostino decided to help Hamblin even though she could've just continued on running. D'Agostino was also hurt, but she didn't give up. She did have to get help from the Americans but she was okay. In that case Hamblin went to the finish line without her. Even though she didn't win they took pride in the Olympic sprit.